But who pays South Africa’s tax? Yesterday, while Minister Nene was doing his thing in parliament with all those EFF-student-stun-bombing backing vocals, I got a bit prickly when he started talking about “tax evasion” and “profit-shifting”. There’s a strong vilification narrative there, and I think that it’s worth evaluating. To be clear, of course I believe that there is a need to re-dress South Africa’s past. We need transformation and equality and the re-balancing of privilege. I don’t think that you’ll find too many people disagreeing with that. But this demand needs to be balanced against what is already happening. So to illustrate that, let me give you some numbers. 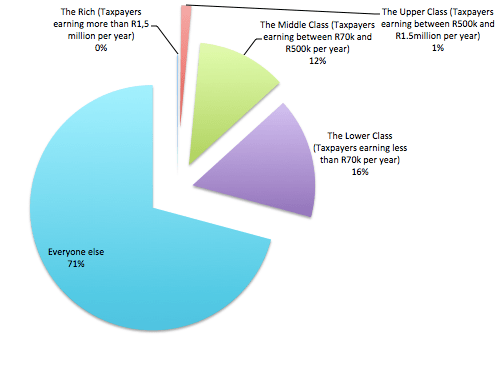 On the basis of personal income tax, the top 1% or so (the 800,000 people earning more than R500,000 per year) pay 61% of the total income tax bill. And I just want to point out that, by almost any standard, this is an extraordinary burden to lay on such a small portion of the population. Both countries pay taxes that equal about 25% of their annual GDP. But do you remember Mitt Romney and his “47% of Americans don’t pay any income taxes” comment that caused such an uproar? Compare that to our 87% who don’t pay income tax. And in 2010, the top 1% of taxpayers in the US contributed about 37% of the total income tax bill. Compare that to the 61% mentioned above. And this is only part of the story. The other side is what the government spends its money on. Because as I mentioned a few weeks’ ago (in this post), there are some countries in the world that manage to collect plenty of income tax (almost 50% of their GDPs). And it seems that the reason they have such a willing tax base is because those States deliver good and reliable services to their people, both the taxpayers and the non-taxpayers alike. In countries where lots of tax is collected, taxpayers get benefits in return for their taxes. Looking at the above breakdowns of government spending, where are the benefits for the actual taxpayers? For my money, there are very few. In general, you could say that the average taxpayer gets the most benefit from “general public services” and “defence, public order and safety” – which accounts for less than a fifth of government spending. And even then, it’s not something that’s especially tangible. I guess what I’m trying to say is: most of the government budget is already “transformational”. When young activists talk about privilege and needing to pay for it, the point is: it is already being paid for. If we say that about 20% of tax money gets received back by taxpayers as benefits (in the form of safety, a police force, infrastructure, etc), then the other 80% is essentially punitive. In some ways, it is more like a fine that one pays for being privileged, or for not needing transformation. It gets handed over in return for no tangible benefits. If you’re relying on 1% of the population to be almost two thirds of your income tax base, then you had best get your spending in order. Because you are vulnerable, and they may leave. Yes, I know that there is more than just “Income Tax” in the government revenue plan. 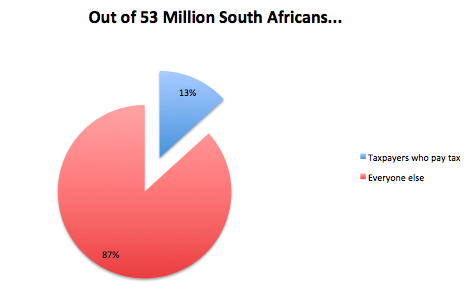 I have written about the other taxes here: How South African Non-Income Taxes Are Paid. Unfortunately, I am only one man with one blog – I can’t write all the posts in one day! But I think you’ll find that the rest of the fiscal plan is designed to support the re-distributive structure of the Income Tax, not undermine it. Secondly, I’m not trying to make a moral argument about whether it’s right to pay this amount of tax, or whether more needs to be paid, or less. It’s just important to point out that the tax base are contributing far more than many other countries would be able to take. Just in a practical sense, you can’t force people to stay here and pay that if they choose to emigrate – so how can we afford to ignore that fact? hi Jayson, thank you for this good break down of taxpayers contribution to taxes. I believe that every productive citizen are paying tax, and that by “empowering” his boss to pay the tax plus VAT and excise tax for the purchases that make. Very interesting. Have you heard of the Lafferty Curve? I feel we are on the wrong side of it and heading to a point where increases in tax rates will result in decreased in tax collections. +1 on the VAT. Not including that in the whole picture is disingenuous. Also I’m glad that “health” and “education” and “infrastructure” don’t count as benefits to you. Must be nice! Thanks for the articles. Very interesting. 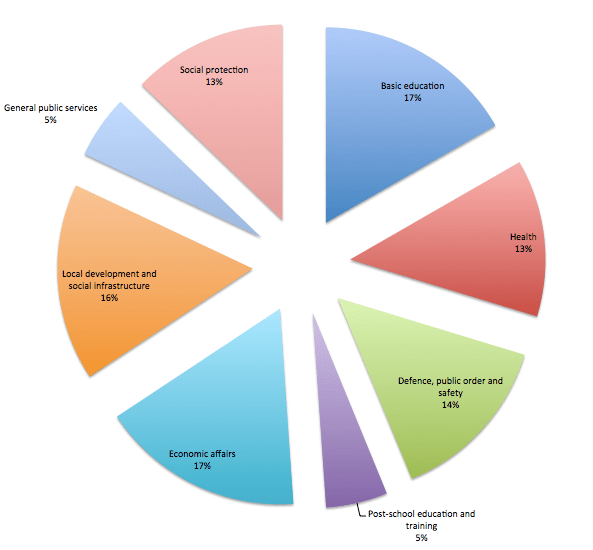 Do you have an analysis of the breakdown of VAT revenue? I have trawled the net and cant seem to find anything; It would be interesting to see the percentages of VAT gleaned from Private, Corporate, fuel, Excise and Customs etc. That could be used to make a relatively good estimate of how the payment is distributed across the wealth band…. How are they benefits? Medical aid, security companies and private schools due to government not having provided any new infrastructure since 1994. They’ve been planning to build a school in my area for years, it was supposed to be done this year, still an empty piece of land. Also would have been the first school built to service the area in 21 years. Though the population has increased exponentially. Nice indeed. Also suggesting that the rich are doing us the favour to stay on and pay their charitable taxes. This is not how the rich operates. They are still here because it makes sense for them to be here. Also financial sense. Well – yes. But by your own argument, it means that the rich won’t be here when it no longer makes sense, or financial sense, for them to be here. And that’s a real concern, because a country with a diminishing tax base has a real problem on its hands. As someone’s already pointed out, for many of the population who actually pay tax; hospitals and police forces, even education in some cases are “benefits” that the taxpayers are paying for but are not actually benefiting from. The rich, upper class and middle class who pay the most tax also pay over and above their income tax for medical aid, security companies and (in some cases) private schooling because what the government provides in these areas is sub-standard. (Don’t quote me on this but i have heard that the whole of SA has fewer police members than New York City). So the 13% who pay income tax aren’t even getting all the “benefits” we are paying for. Interesting read. Doubly interesting with the recent comments by the leaders of SANCO, calling for the rich to pay “just 2% of their annual income” to fund Tertiary education. They obviously aren’t aware that the “rich” are already paying ~40% of their annual income (plus many hidden taxes) in order to fund social grants, public healthcare, primary, secondary and Tertiary education, the police force, the government, infrastructure development and so forth. The analysis is biased because it focuses solely on income tax yet there other forms of tax like companies tax, dividends tax, estate duty, VAT and many other forms of tax. Is that kind of tax not funding public expenditure? I think the rich should pay even more! Remember that we are a highly inequal nation that is not willing to address the imbalance. Tax is one of the many ways we can address this. It is fair for those who earn less than 70k not to pay tax, the struggle is real out there. Companies must pay more tax if they make more money without employing more people. Please tell me why I, who did not have kids cos I could never afford it must pay more and more so that people who earn less than 70K can have 3, 4, 5 …hell 8 kids? Why is all the responsibility at the top and nothing at the bottom end? Our social grants wouldn’t have to be so damn high if people can take responsibility for their own lives and families. You could not afford kids? More like you were not willing to sacrifice lifestyle for having children. Don’t talk nonsense to people who can read. You’ve raised some great points. I often try to avoid using “class” as a term very loosely because its meanings as a social construct and economic one could be confused. Tregenna & Tsela (2008) among many other pieces on income dynamics in South Africa could be used the argument that the high income individuals (“the rich” as you call them) are anyway affected by our progressive tax system, as they have been shown to be much better at protecting their income than middle to lower income earners. Depending on what year you choose to look at income tax contributions you may find the middle-income earners contributing a greater deal. The National Treasury did however agree that a situation where most revenue from an emerging economy being sourced from individuals was unsustainable, as industry is expected to provide a much larger contribution. It may evade some, but the issue isn’t really one group of income earners carrying the yolk of the tax regime, it is actually not having enough upward mobility. If the top 1% make more than the bottom 50% combined, there’s nothing wrong with that income being padded by a tax scheme that bears in mind the unequal distribution of both income and wealth in the country. The Romney comment in particular caused an uproar because many were still reeling from a recession largely not of their own doing, he forgot to mention that a large part of that 47% had paid state taxes, and seen most to all of their taxes refunded through tax breaks and social transfers. You haven’t said it but I read it in one of the comments, tax is not a charitable donation and if it were, high networth individuals would pay less of it. It is there and it is high because we understand that at parity,being a millionaire in SA provides as much bang for your buck as any other similar economy. Last note, I too love the high drama of US politics, but often it’s better to provide a like-for-like comparison. I do believe it is not an attempt to be disingenuous, but you may have had similar success in emphasising your point through comparing South Africa with a BRIC, upper-middle income or other emerging economy. The economies you compared South Africa with used colonisation or subjugation of other peoples (slavery) to beneficiate their own population (50% GDP nations Denmark, Belgium etc.). In other cases there is high state ownership and control (Norway, Cuba) of strategic industries and resources. From the introduction I presume that would not sit well with many of the “privileged”. The ideas are mostly good, but I fear the delivery may mislead someone who isn’t prepared to take them further (whether they are opposed or for them). It’s often difficult to make an amoral argument when it comes to taxation, and while you qualify your stance at the end you do however imply the existence of “unfairness” which is a moral argument over an economic one. If it were the latter you would have went into the impacts of illicit outflows as you began the article. Had you investigated that issue you’d also find that moving currency into tax havens is eroding our tax base, inhibiting growth, heightening inflation and worsening poverty. I look forward to engaging again. I’m one of the “super-rich” and I started out as a student who studied and worked myself up to a successful businessman. Why should I pay more than 41% tax to bring you up to my level? People like you have such a sense of entitlement and remove any incentive to strive for prosperity. Why should I even work if all I have to do is subsidise you? I might as well sit back and relax three days a week, lower my tax bracket and enjoy life a little more. I don’t work 80 hours a week to be placed on a permanent guilt trip by guys like you. My tax is basically charity as we get nothing in return from the country. I would like to rather sponsor a student….I also held two jobs and built myself up..and the more I earned the more tax I pay. I suggest we all help and mentor others…to develop skills and become and active member of the workforce…..
Read the article again. It answers all your points. It’s a ridiculous state of affairs, in SA if you have the money you can also hire tax consultants to shift and wiggle money out of the tax lime light to “re-invest” in things that generate incomes e.t.c or shift off-shore. The whole tax system is about as bent as the banking system, all to exploit the middle classes. I don’t pay tax and I never will. Where is the % that the regime seals and corrupt yearly? Are we supposed to feel sorry for the super rich because the taxes they pay make them slightly less super rich? Let’s not forget on whose labour they get rich. If the rich CEO of a big company pays taxes so that the middle and lower class people who do the work for the comapny get more benefits and are happier and more productive, then the rich CEO is getting a return on his taxes. It is short-sighted to say unless he has direct benefit from his taxes then he shouldn’t have to pay them. So CEO’s just arrive at that income? If you did any research then you’d see that the vast majority of CEO’s started as small as everyone else and then worked themselves up. Many CEO’s actually started their own companies and put decades of work into it. It’s easy to target the super-rich but only because your own jealousy doesn’t allow you to remove the blinders that don’t allow you to appreciate that most of them are reaping the rewards for long-term hard work. Forgive me, but it is you who demonstrates a sense of entitlement and, may I suggest, arrogant superiority. There are millions of South Africans who have worked every bit as hard as you, if not harder, but have reaped no rewards because they have been denied education and opportunity – think of those who clean your house or those down our mines. To suggest that earning power equates to hard work is an insult to most of our population. It’s a privilege to be in a situation where one CAN pay tax; but galling when it is wasted. This is very interesting, since so many South Africans think so much better in numbers lets try and work out what we each owe for Apartheid. We can calculate the number of years each of our white ancestors lived in this country and try and guesstimate what they paid in tax (This will be difficult but I’m sure some of our clever numbers people can do it.) To be fair we will have to work out the exact portion of the total we are responsible for. After having worked out how much our families have contributed to the active oppression of most of our countrymen, we can try and work out what the the cost in actual damages was to each child born under this regime, which of course escalates with each generation born further into poverty and oppression. Then we can try and get an exact figure that each of us owes and start deducting the amount of income tax we have paid from that. Direct your eyes to Zambia…..and learn its history. As a sole proprietor, and being taxed as much as I am, I can’t afford to employ anyone. If I wasn’t taxed, I could employ many students and offer internship, which would empower these students with the necessary knowledge, hence improving the standards expected in the really world. Just saying. Annual Revenue less than 1 mil in small business should be scrapped. More entrepreneurs would also see the worth, of going on their own. Why is there ANY privilege in the first place!? Why can’t it just be a matter of “those people who work for something get it”? Minus the ~25% of people in the country who are unemployed (13 250 000 people) bringing that number accurately down to ~40m people. So this particular pie chart is no longer accurate. 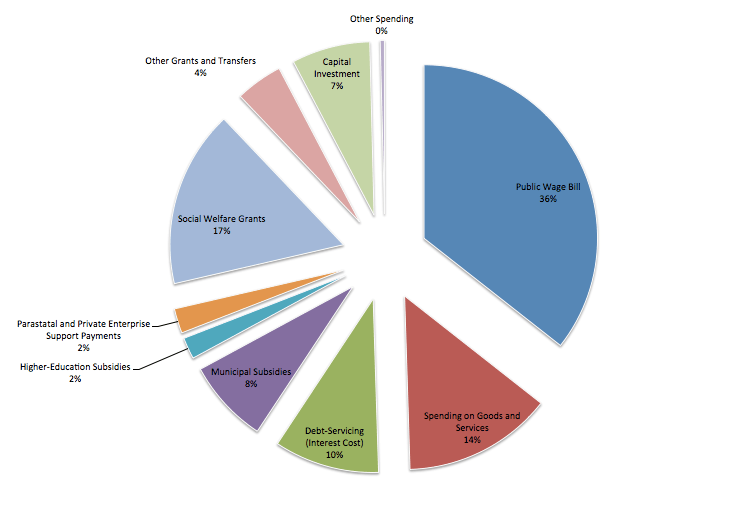 So why is 16% of this pie chart indicated to be “Taxpayers earning less than R70k per year”. Are they still taxpayers if they don’t pay tax? The ANC have had 20 years to readdress some of the inequalities through redistribution of wealth but you still have BEE in operation. Both the DA and the ANC would like BEE to continue so that the whites in South Africa continue to shoulder the majority of the tax burden. Alot of blacks have become extremely wealthy and not done anything of significance to acquire this wealth apart from being black and knowing the right people within the ANC. Not sure if the hierarchcy within the ANC or the DA are capable of understanding the harm that is caused by following a Socialist/Marxist economic model because througout history following these models has lead to economic failure of national economies.The poverty gap between the poor and the wealthy under the ANC has increased from the era of appartheid which is testament to the complete failure of economic mangement of the the South African economy by the ANC and its followers. Indeed and now those rich black people pay tax too. The more people we lift out of poverty, the wider the tax base. Regardless of colour. tax models, and all this talk about clever people, good with numbers… it all starts with the wrong assumption… “that taxes are necessary and must be paid.” put your clever heads together and come up with models where taxes are not in the equations. now that is real genius… and would make this conversation obsolete. We are heading for a new government anyway (we can’t live under this one too much longer) … why not create a whole new system – instead of trying to fix this broken one?!? release the genius and stop playing with broken systems…please! stop wasting brain power trying to wrap your clever heads around taxing systems and budgets… let your minds go and create new systems that don’t need these antiquated models. (…and please don’t say it is utopian dreaming… it’s visionary and genius… and we will laud those who formulate these new systems – “A Beautiful Mind”) taxing is what overlords do to their subjects… and we should never find any comfort in this sort of system. so think harder… you haven’t yet been approaching this in the correct way. Seriously? The only counties of our size or similar where the income earners don’t pay tax are those with enormous mineral resources. Unless you want to transform the country into a giant casino? South Africa simply doesn’t have enough to trade. Thanks for your input. I’d like to know if you would like to connect with us at OUTA. We will shortly transform our acronym and thereby expand our purpose, from Opposition to Urban Tolling Alliance, to Organisations Unites against Tax Abuse. Our belief is that the public can (and must) stand up for their rights. We have demonstrated how this is possible with the e-Toll tax (now defunct with less than 25% people paying). The student protests have demonstrated how to reduce fee increases. And the time is ripe for citizens to say no to Nene’s planned tax hikes, on the basis that before he tries to do so, he (and the entire cabinet), must address the estimated R100bn or so lost through maladministration, poor procurement and corruption each year. Someone like yourself could be of benefit to OUTA’s cause going forward. Hi interesting article, but don’t you feel in your first graphic you should account for the proportion of the population who are definitively untaxable. You know, minors and unemployed/unemployable adults. Thanks for your comment – and I agree that is one way of looking at it (although there’s no age restriction on tax – minors can and do have to register as taxpayers if they have some kind of income, like from trust fund assets or something like that). The thing is: the tax proceeds get distributed universally (or, at least, that’s the idea). There are grants for minors and the destitute. What I was really trying to show was how many income taxpayers there are in South Africa, and also, to keep it comparable to other statistics that float around in the news (like Mitt Romney’s 47% of Americans that pay no federal income tax). It’s the trouble with statistics – there are always “more accurate” ways of measuring something – but the accuracy is very much guided by what the point was of mentioning the statistic in the first place. In this case, I wasn’t trying to say “this is who can and should pay income tax” – I was just saying “this is who pays it, and this is who does not”. I think that there is a disturbing tendency from our policymakers to treat the wealthy, or those perceived to be wealthy (which includes small business and farmers) as an inexhaustible fount of revenue. This encompasses not only the tax policies, but a range of policies on labour legislation, licencing and approval processes for some businesses, rates, and other little policies that chip away at profit. I don’t know enough about economics to know what can, and should, be reasonably expected from the taxpayer. We’re an unequal country and it’s only to be expected that the upper end of the scale will bear the brunt of the tax burden. But to say we don’t get benefits from that burden is to ignore a range of services we take for granted. The thing with services is that we only notice them when they break down. When they function we either ignore them or maybe grumble a little if they don’t work 100% all the time. But what everyone CAN agree on is that there is phenomenal and unacceptable wastage of that tax revenue. Much of it is hidden. The big bailouts and corruption stories make the headlines. But after nine years in government and parastatals I can tell you that there is plenty of unnecessary expenditure that doesn’t meet the auditor-general’s requirements for “wasteful and fruitless” or “unnaccounted for”. Remember, the auditor-general’s job is to make sure that procedures are followed and that expenditure meets the objectives of the institution. Expenditure that follows both of those criteria, but could still have been cut through simple efficiency, will not raise a red flag for the auditor. So employing a consultant for R200,000 instead of deploying trained professionals within the department to do the same job might not raise the auditor’s eyebrows because the auditor is external and cannot be expected to know of all the wasted expertise within the department he is auditing. As long as the consultant has been hired following all correct procedures, it will probably be considered correct. And then the big headline stories are only the tip of the iceberg. There is a R500 million dairy farm involving the Guptas http://mg.co.za/article/2013-06-07-00-gupta-dairy-project-milks-free-state-coffers. That’s two Nkandlas. In one financial year, in one provincial department where I worked, there was R156 million of unaccounted for expenditure. On top of the “unaccounted for “expenditure was a great deal of shoddy management, inefficiencies and civil servants getting salaries for doing very little (there were also civil servants doing fantastic work and that should not be forgotten). It doesn’t matter what all this mind-strutting here is about. Fact is our government is steering this country into a cesspit. Own up or get out! Keep it up, we need more posts like this. I am a teacher who teaches economics and i aim to teach my kids about this so they can be aware of what they should be aware of and what they should be thinking about 5 years from now when voting. Thank you for affirming what is going on in reality. It’s worth noting that 53 million South Africans are not all potential tax payers or would-be payers or should-be payers. Either you need to look at people 18+ as your total tax-paying sample in the first segment, or consider the different sectors of employed, versus seeking employment, versus unemployed. It’s a bit of a stretch to imply or illustrate that an 11 year old child is not excluded from the tax-base. *is excluded from the tax-base. Thanks for your comment. I think that I’ve answered this question in reply to an earlier comment – but basically, I would agree with you if I was trying to argue in favour of needing more taxpayers. But I don’t really agree with that, because I think that the people who are paying tax are the people that can pay tax. All I’m trying to say here is that the current tax base makes South Africa vulnerable, because it is such a small segment of the population relative to the number of beneficiaries (which include all non-payers of tax – minors, the unemployed, the aged, etc). It’s why I worked off the whole population. I think you have your words wrong, we dont need transformation, equality or rebalancing…. What we need is Integration, Justice and Transparency. Taking nothing away from your well written article, thank you. Instead of transforming the economy we need to integrate previous disadvantaged people (white black and yellow) into a working class, that alone would create tax payers, next we need to tax everyone so that we all contribute money to the economy and lastly the type of transparency needed is one of openness about everything, people are scared about what they dont know and this is why our businesses and investors are pulling back. Since my teens I had full time jobs and been an entrepreneur in my spare time while building a property portfolio as a pension plan…. I work hard and aim to retire in my early 50s…..so I can teach financial literacy where I can. I also believe in uplifting others…by mentoring those of all backgrounds and age groups about financial independence, property ownership..and ultimately retirement planning….which I find the majority of graduates know very little about………as this is just not part of the curriculum. There are many educated but poor retirees who worked for a lifetime….but never took the time to understand the implications of not planning for life without a salary……. Not many pension schemes cut it…. How woukd the figures be if we moved from Income tax to a higher VAT on all expenditure.. This would combat the matter of tax avoidance…. A debate we often have here… or rather uplift someone and pay less tax….A win win for all. To answer one of your readers questions, tax payers who don’t pay tax have their tax rebated…. It’s probably been asked already, but why are you suggesting people may take their privilege elsewhere? As far as I can tell, much of it is already gone. Homecoming Revolution has never proved its claims. The RW Johnson scenario is unfolding as we watch. Appreciate the story line and the effort to present it. There are so many angles to cover on these kinds of matters; there are likely to be missing ones. That is the value of a conversation, others contribute further to fill out the subject. The one angle I raise is what countries we compare SA to. It would certainly be of more interest to me if one could compare each element of the analysis (tax burden, where it sits, public sector application of taxes, outcomes achieved, and so forth) with the likes of Brazil, India, Malaysia, Nigeria, etc. As an aside – the underlying problem is that the economy is “too small”, has not grown at a required rate, has not managed to educate / skill enough people to be employable, government has not invested in wealth facilitating infrastructure, government policies do not appreciate market dynamics. etc.. Fewer and fewer people and entities will pay more and more, and we’ll all get less and less if we do not sort the underlying problems. Good write-up – those points were up there with other thoughts I’ve been having this past year.Funnily enough, I was already starting to look at immigration more seriously this year because of the tax situation in this country. Fortunately, should I want to move then the process will be slightly easier as I’m in the design business and that’s relatively movable but I’ll definitely miss the people here. Thanks for the information. September 2017. Perhaps time for an updated comparative chart plus add in the cost / value of free services ( water, electricity) subsidized by rate payers through property rates and taxes.